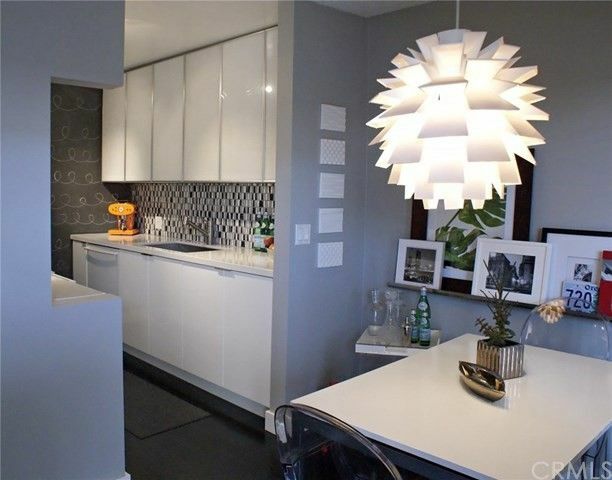 This Alamitos Beach remodeled designer home with private parking is sure to impress! Just 1 block from the beach, this stunning top floor home resides in the highly sought after "Stardust" mid century modern complex! This complex offer secure entry and a fabulous mid century modern vibe with updated lobby, elevator and common area features. This highly upgraded residence offers gorgeous wood floors in the main living area and kitchen nook. The kitchen has been fully updated to include modern Quartz counter tops, high end Porcelanosa backsplash tile, Bosch Dishwasher, LG appliances and custom modern cabinetry with under cabinet feature lighting! The bathroom has been updated with custom light fixtures and a modern sink and hardware and the bedroom offers custom designer paint and ample closet space along with views. This truly embodies the fabulous California ocean front lifestyle and is just steps to the beach, nearby dining and entertaining as well as Bluff Park and the fantastic Broadway corridor. Conveniently located between Belmont Shore and the rejuvenated Downtown Long Beach areas this home offers it all! Low HOA dues and 1 car gated and secured subterranean parking space with extra storage make this a truly rare find! Make the move now as this stunning home will not last long! Directions: Esperanza to 1st st off of Ocean Blvd.